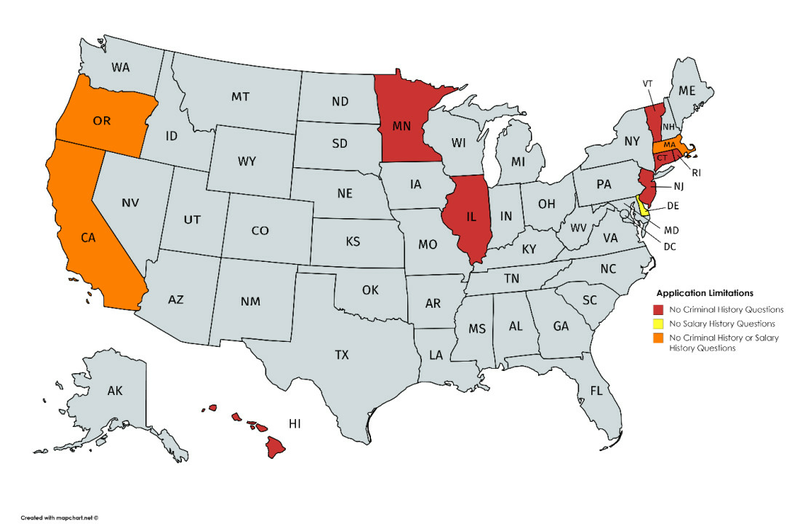 Effective January 1, 2018, California became the tenth state to bar private employers from asking about conviction histories on job applications, joining Connecticut, Hawaii, Illinois, Massachusetts, Minnesota, New Jersey, Oregon, Rhode Island, and Vermont. A number of cities, such as San Francisco and Chicago, have also enacted “ban the box” type ordinances. Also effective January 1, 2018, California joined Delaware, Massachusetts, and Oregon as the fourth state to prohibit inquiry into the salary histories of job applicants. Some cities, such as New York City and Philadelphia, have also passed laws prohibiting private employers from delving into salary histories with job applicants. For ease of reference, the infographic below shows all of the states with these types of restrictions in place currently. Now is an ideal time to review employment applications and standard interview questions to ensure compliance with applicable laws. For additional information on these restrictions, please contact one of Honigman’s Labor and Employment attorneys.